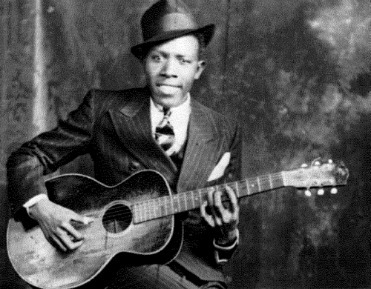 I wrote this piece on the occasion of the Robert Johnson Centennial in May of 2011: Reassessing the worn-out folk legend about his meeting the devil at midnight at the crossroads, it reports on the state of the 21st century blues from the perspective of a contemporary Mississippi blues player, Cedric Burnside. I hope you enjoy reading and as ever, let me know what you think. “You have to wonder if Johnson was playing for an audience that only he could see, one off in the future,” Bob Dylan writes in his book Chronicles of Robert Johnson, the 20th Century blues giant whose work is still celebrated. Johnson’s 29 songs were prescient in the way they would shape folk, rock, blues, and soul—as was his groundbreaking style of playing and singing them. From old-time and ragtime, to uptown Chicago strut, Delta picking, and hill country stomp, the root of all blues can be found in the songs of Robert Johnson, serving all forms of folk, rock, and even soul-jazz. 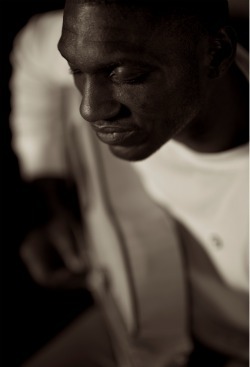 Johnson’s songs have survived homages by artists diverse as the Allman Brothers and the Rolling Stones, Gil Scott Heron, the White Stripes, Keb’ Mo’, and satirists like Tenacious D. Indeed there is something supernatural about the way Johnson’s music, as well as the Faustian myth surrounding him, has survived time and outstretched the work of musicians from here to Yazoo. But far more went into his achievements than a simple midnight pact made on the hallowed ground at the famous crossroads where Highways 61 and 49 now stand. “I have to say, I’m a big fan of Robert Johnson’s music, and always have been, but when it comes down to him selling his soul to the devil, I don’t believe in no type of stuff like that,” says musician Cedric Burnside. “I think he really buckled down and practiced a lot and came out blazing.” Burnside is right about Johnson’s devotion to his music rather than the devil according to the Johnson scholars who’ve studied his life and music for over 50 years now. But there is enough drama, dirt, and lowdown on Johnson to fuel a legend in his likeness and many more like it, drawing as it does from existing folk tales and details drawn from the hard scrabble lives of other blues players and the lives they led as black men in the Jim Crow South. As grandson of the late R.L. Burnside, the rural South is something that Cedric knows something about; he worked alongside his grandad who sharecropped for food and shelter until Cedric was nine or 10. As for what he knows about Johnson, he learned that from his grandfather, too. He says Johnson’s works ring true to his experience in the rural blues. As a kid growing up, Burnside says the family didn’t have a radio. “My grandad used to have house parties. He’d invite all his friends over; they’d set up on the porch, set up a little raggedy drum set and a little piece of amp, and go to playing, and that was our music. He explained to us, some of it was Muddy Waters, some of it was Howlin’ Wolf, and some of it was Robert Johnson. That’s how I came to know some of the music, by my grandad playing some.” Burnside is a fan not only of the Johnson guitar style, notable for sounding as if more than one guitar is playing simultaneously, but for his lyrics. “Some of the songs he wrote you can relate to, like ‘Come on in My Kitchen’—I definitely related to that. And ‘When You Got a Good Friend.’ They hit you right where the heart’s at. Anybody that done heard Robert Johnson or hill country blues will love to come to a live show; if they’re hearing it for the first time, they’ll love it for the rest of their life,” he says. Clearly Burnside is a blues advocate and doesn’t have to be persuaded to talk up his state’s most famous export. He touts the North Mississippi All-Stars as “great musicians” and when I ask for recommendations he tells me the sister/brothers act, Homemade Jamz Blues Band, from Tupelo, are “phenomenal” (I have to say I agree). But Burnside reserves his utmost respect for the living Mississippi bluesmen Hubert Sumlin and James Cotton who made their marks with the Howlin’ Wolf and Muddy Waters bands, as well as for Johnson’s contemporary Honeyboy Edwards, all of with whom he says it’s been his great honor and pleasure to play. The experience of sharing stages with these men places Burnside in a direct a line of Mississippi bluesman whose roots connect up directly with Johnson’s. The Mississippi Delta region was rich with folktales and blues musicians in the early part of the 20th century, their traditions and sounds descended from slaves from West Africa. Dislocated from their homeland and mistreated to degrees that they don’t teach in school, these men, women, and children were often put to work picking cotton for landed gentry. Once slavery was abolished, those who did not escape or migrate north often found work as sharecroppers, tending farms for owners who paid them a grossly disproportionate piece of the pie. As time went by, conditions in the South didn’t necessarily improve for black men and their families who subsisted in a cycle of poverty. A man could be incarcerated simply for being on the street at night (the subject of Johnson’s song “Crossroads”), then sentenced to work in a labor camp or on a chain gang. This was the fate that Johnson intended to escape, and it motivated him to master music; it also kept him on the move throughout his short life. In 1930, the blues singer Son House moved into the area where Johnson stayed, as did Willie Brown (who Johnson shouts out to in “Crossroads”) and Johnson picked up what he could from the blues professionals. By now remarried and with a child, Johnson’s second wife fell ill, and the crisis sent Johnson leaving town again, this time to perform in towns around Mississippi, Arkansas, and Tennessee. He found a new mentor in Ike Zinnerman, said to have developed his power by playing in a graveyard—and there again, a supernatural connection. The details have been debated for years now, but historians generally agree it was a comfortable life Johnson created for himself, away from the hard labor that caused others to be too tired to enjoy much of anything, much less develop prodigious skills as a musician. But it was no easy ride: Not only did Johnson have a habit of loving up other men’s women, the menfolk were jealous of Johnson’s ability to get away with not working (therein the beginnings of another archetype that has persisted in and around rock ‘n’ roll for years—the layabout musician). When he eventually returned to Robinsonville, blues elders like House and Brown were said to be surprised by Johnson’s new-found professionalism. He was ready to record. Now keeping company with Estella Coleman of Helena, Arkansas, a woman 10 years his senior and mother of Robert Lockwood, Jr., Johnson took a shine to “Robert Junior,” just four years younger than him, and taught him everything he knew, deepening the family ties among bluesmen and between de facto stepfather and son. 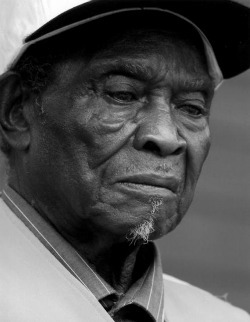 Johnson also fell in with an alliance of musicians including Honeyboy Edwards, Hound Dog Taylor, Robert Petway, and Tommy McClennan, all of whom were forging careers of their own. He traveled with Edwards and Johnny Shines performing all types of songs, including his own “Terraplane Blues.” Ladies loved this song concerning the flashing lights, oil checks, spark plugs, and starter on an automobile, although it wasn’t just the sensational metaphors that attracted listeners. Johnson had a smooth style, developed and honed it, and when he played, it was like listening to a one-man band. So extraordinary were his abilities that to this day there persists a misguided theory that his tapes were sped up to achieve the otherworldly effects. Which leads us to the jealous husband who poisoned him—a story that is most likely true, according to Honeyboy Edwards, who was with Johnson on his final rounds. Although, the cause of death was more likely the pneumonia Johnson caught while he was laid up from the poisoning, had he heeded the advice of Sonny Boy Williamson to never drink from an open container, he may’ve avoided this fate. But then he would’ve missed all the women who reportedly sat vigil for him, attempting to nurse him back to health. And had he not fallen so ill, who knows if he would’ve felt the need for a last-ditch conversion on his deathbed, written in longhand and printed on his tombstone (one of three gravesites in the Greenwood/Hazelhurst area): “… I know that my redeemer liveth and that he will call me from the grave.” To this day, there remain three burial sites for Johnson: Mount Zion Missionary Baptist Church, Payne Chapel, and Little Zion Church. The era immediately following Johnson’s death found his songs becoming embedded in the repertoire of his fellow Delta bluesmen like Muddy Waters, Elmore James, and Arthur “Big Boy” Crudup, to name but three whose blues helped shape rock ‘n’ roll. And yet it wasn’t until the release of King of the Delta Blues that the real obsession in the hearts and minds of musicians and fans began to swell. At the time that Dylan, followed by Keith Richards, Brian Jones, Mick Jagger, and Eric Clapton, first heard Robert Johnson, there wasn’t even a photograph of him, just 29 songs and a myth a mile long. In 1973, the first photographs of Johnson were found, the familiar close-up with cigarette and long-shot with guitar. It was in these years that Johnson’s connection to rock ‘n’ roll was established that the crossroads bargain myth grew larger. Led Zeppelin, their “Traveling Riverside Blues” and obsession with all things blues and magical, certainly contributed to spreading the music’s mystique around rock ‘n’ roll, as did the high era of ’70s Rolling Stones and their back to country-blues period around Exile on Main Street. By the ’90s, when Columbia issued The Complete Recordings, a generation raised on the myth of Johnson and rock ‘n’ roll was ready to embrace him like never before. In 2008, a third photo of Robert Johnson was published in Vanity Fair magazine. Moving footage surfaced but was quickly waved away by scholars; in particular it was nixed by Robert Lockwood Jr.who definitively stated the man in question was not Johnson. In lieu of that holy grail of all Johnson artifacts, the inevitable digitalization and commercialization continues: Columbia’s issued The Centennial Collection of The Complete Recordings as both two-disc and four-disc sets; Dogfish Head brewery makes Hell Hound on My Ale, a Johnson-inspired craft beer. One suspects a Johnson hologram is on the horizon.